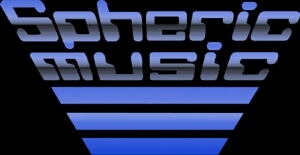 Click on the banner above to visit the Spheric Music web site. The Spheric Music Festival will be held on March 5, 2005. Click on the banner above to go to the Spheric Music web site. Click on the banner above to visit the Klaus Schulze web site. Before Klaus Schulze started his solo career with the release of his first solo LP "Irrlicht" in 1972, he was instrumental in the development of Krautrock and the Berlin School of electronic music. Since then, he has continued his leading role in the field of electronic music as well as performing in collaborations with important artists such as Solar Moon, the Cosmic Jokers, and Pete Namlook, just to name a few. Click on the banner above to go to the Klaus Schulze web site. Click on the photo above to visit the Steve Roach web site. Click on the name or photo above to go to the Steve Roach web site. Click on the photo or logo above to visit the Radio Massavre International web site. Radio Massacre International comprises Steve Dinsdale (Keyboards, Electronics, Drums), Duncan Goddard (Keyboards, Electronics, Bass), and Gary Houghton (Guitar, Keyboards). Since 1993 they have been building a catalogue of epic electronic improvisations, distilled into permanent records by the wonders of digital editing. After accumulating a library of 30 such pieces they finally released the double CD 'Frozen North' in late 1995, and appeared live for the first time at the Emma festival in Sheffield. The band was also featured on the BBC's World Service, thus finding a truly international radio audience for the first time. RMI had a website long before it was obligatory, and this has enabled the forging of relationships with listeners, promoters and radio stations across the world. Incorporating a cosmic musical vocabulary, RMI's music contains influences from Krautrock, Progressive Rock, ambient, and Berlin School sequencer music. Click on the logo or photo above to go to the Radio Massavre International web site. Click on the photo or logo above to visit the TouchXtone web site. 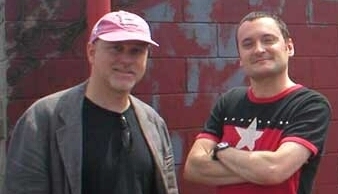 TouchXtone is comprised of Michael Thomas Roe and Jim Combs. Michael played drums from 12 years old and discovered synthesizers early in college when he began to piece together strange and personal compositions. A recording and publishing contract with Atlanta label Rising Star Records, resulted in three New Age CDs: "Forest Cathedrals" (1993), "Seashore Solitude" (1993) and "Lake Infinity" (1996). 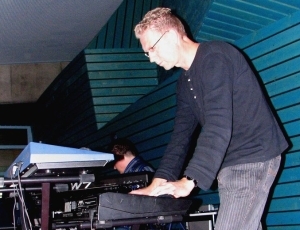 In 2002, Michael met Jim Combs and TouchXtone started as a synthesized improvised ambient space band. Michael has recently completed a collaboration with Tangerine Dream/Kluster founding member Conrad Schnitzler entitled Mi.T.-CON 04. Jim Combs is an Oklahoma-born and Texas-raised keyboardist/composer, recording producer/engineer and multimedia artist who began his musical forays in the early �70s both playing piano and manipulating tape machines while recording feedback. Synthesizers entered his life in 1974 when he built a PAIA synthesizer kit and heard Rick Wakeman's "The Six Wives Of Henry VIII." He has been making noise and music with synthesizers and recording gear ever since. He started his career at CBS Records where he held positions of College Marketing Manager and Single Records Coordinator and got to hang out with just about every late �70s/early �80s music icon on the road at the time. After a stint in NYC producing and composing, Jim ended up in Atlanta and met Michael. Click on the logo or photo above to go to the TouchXtone web site. Click on the name or photo above to visit Mark Jenkins' web site. Mark Jenkins started out creating video graphics and electronic music during his days at university. Since then, he has gone on to do almost everything a musician could do in the industry. Mark has written and edited for magazines such as Electronics And Music Maker, Electronic Soundmaker, Melody Maker, International Musician, Music Technology, Studio Sound, Sound On Sound, Future Music, Music Week, and Music Business. In 1983, Mark was an organiser for the first UK Electronica festival, which he eventually took over, taking it to its best attended event to date. Mark also performed in some of those UK Electronica concerts as well as many other notable events such as Omame Ecological Festival in Brazil, International Star Wars Convention, and the Alfa Centauri Festival in Holland. Mark has composed for computer games, film, theatre, and virtual reality systems including those from the award-winning Virtuality. His solo CD "Space Dreams" was one of the UK's most popular synthesizer releases ever. Outstanding reviews compared Mark's music favourably to that of Jean-Michel Jarre, Jan Hammer, Mike Oldfield and Tangerine Dream. He has released many more solo CDs and appeared on quite a few compilations, too.
. Mark has appeared in concerts headlined by the best; Robert Schroeder, ex-Tangerine Dream members Chris Franke and Steve Jolliffe to name a few. In 1985 he launched AMP Records. The label's first release, a compilation, was followed by solo titles and compilations featuring Michel Huygen, ex-Tangerine Dream member Steve Jolliffe, Keith Emerson (ELP), White Noise, Tangerine Dream, Paul Nagle, Daevid Allen (Gong), and Richard Pinhas (Heldon), Michael Stearns, Michael Rother (Neu!) with Dieter Moebius (Cluster), Nick Rhodes (Duran Duran), Paul Haslinger (Tangerine Dream), Hideki Matsutake (YMO), Dave Greenslade (Colosseum), Nash The Slash, Vince Clarke (Erasure) & Martyn Ware (Human League/Heaven 17), Geoff Downes (Asia), Damo Suzuki (Can), Harald Grosskopf (Ash Ra Tempel) and many others. Mark has recorded with Steve Jolliffe, Richard Pinhas and ex-Van Der Graaf Generator member David Jackson, and produced and contributed to music for the BBC2 documentary series "Edge of Green Heaven." Click on the name or photo above to go to Mark Jenkins' web site. Click on the name above to visit the music-bar's web site. Ampfea plays host to a number of mailing lists, one of which is the music-bar. The music-bar is an internet mailing list where emusicians from the world over gather to talk about all the facets involved with the creation of electronic music and to socialize. Of course, the socialization process for musicians includes jam sessions. On many occaisions, both in North America and in Europe, music-barians have gathered to meet, eat, drink, and to play music. This month's Special Focus looks at the music-bar and its members through the music they have created together. Some members have produced music heard on Galactic Travels before and some have not. Through music-bar jam sessions, more music-bar members get their music heard and Galactic Travels begins its look at how the internet affects the electronic music scene. Click on the name above to go to music-bar's web site. Click on the name above to visit the artist's web site. Ken Martin hails from the UK and is a master of the Berlin School genre. He also brings in other genres, bending the music to his unique and beautiful vision. Some have said that he comes closer than anyone to sounding like Klaus Schulze. Yet, his voice is clearly his own. This month, his releases on Space for Music Records are featured. Click on the name above to go to the artist's web site. Click on the logo above to visit the artist's web site. Remote Spaces is a duo comsisting of Konrad Jakrzewski and Krzysztof Rzeznicki from Poland. Their music is firmly based on the best electronic music traditions established by Tangerine Dream. Since the Remote Spaces website is in Polish and doesn't have any pages in English, I have little information at hand. I will update this page when more information becomes available. Click on the logo above to go to the artist's web site. Click on the name or photo above to visit the artist's web site. 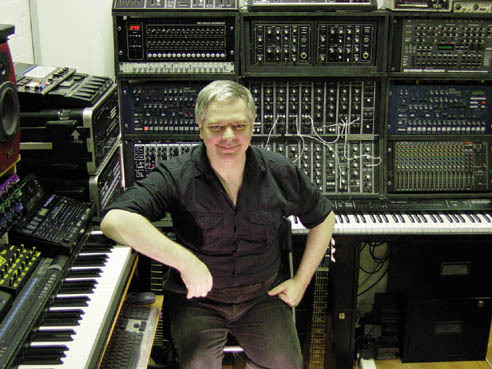 Lambert Ringlage has been making synthesizer music since 1982. His musical origin is as a drummer and electric guitarist in Rock'n'Roll. Lambert discovered his preference for electronic music when he heard Tangerine Dream's "Stratosfear." Like many artists, some of Lambert's music has been influenced by the music of T.D. His success in an April, 1991 concert encouraged him to prepare his first solo CD, "Inside Out" which was released fourteen years ago this month. 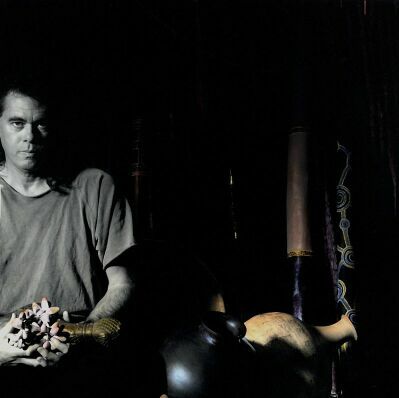 Lambert's collaborations with Alien Nature, Jiannis, Stephen Parsick, Frank Makowski, and Palantir resulted in CDs released on his Spheric Music label. Gert Emmens has been releasing CDs since 1995, though originally in a pop style. But by 1997, Gert had rediscovered electronic music and even won an Alfa Centauri composition contest. That sealed the deal and Gert has been producing EM ever since. In 1999 his first EM album, Elektra, was released on Quantum Records, though he was still looking for his prefered style. By the time his second EM album, Asteroids, was released in 2001, Gert had found his prefered style; traditional Electronic Music, inspired by Berlin School but mixed with his romantic minor chords and modern rhythms. Gert has played at E-Live and Alfa Centauri festivals and now also collaborats with Ruud Heij, well known for his contributions with Free System Projekt, Patchwork and Kubusschnitt. Gert and Ruud have released two CDs together at the time of this writing.